Manager Tony Mowbray says Middlesbrough must keep faith with their playing style despite dropping out of the Championship play-off places. was a seventh defeat in nine league games and saw Boro slip out of the top six for the first time since 22 October. 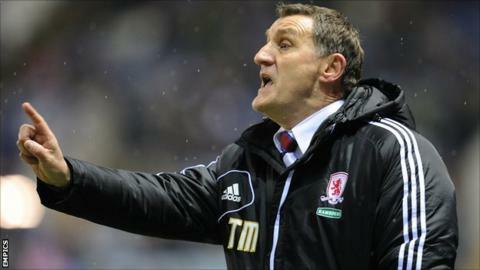 "We tried to play and tried to do the right things," Mowbray told BBC Tees. "There's no point throwing everything in the bin and scrapping it, we have to do what we believe in." Boro's form since the turn of the year has undone a fine run in 2012 that at one stage saw them record a nine-match unbeaten run. Mowbray added: "I can understand the frustration, but if that's how we've won the games that got us there, we have to continue to do that."